Teaching EFL in Saudi Arabia brings a number of challenges to any teacher from the West, but perhaps one of the biggest challenges that stands in the way of achieving lesson objectives on a regular basis is a lack of motivation to learn English amongst a large proportion of the students. It may not seem like it at first, but in reality, Saudi students are no different to students from anywhere else. In around 6 years as a teacher in Saudi, I’ve taught many different students from many different backgrounds, with different levels of proficiency and different life goals. Of course, there is a huge difference in culture between the Saudi and the United Kingdoms, but the role and the psychology of the student is a universal one that is not defined by nationality. 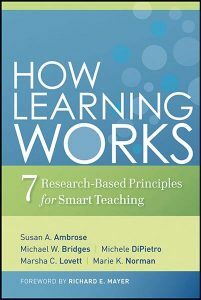 I recently read the book How Learning Works: Seven Research-Based Principles for Smart Teaching (Ambrose et al.) and found some very useful guidance that I hope to keep with me for the rest of my teaching career, but one of the most salient principles covered in the book was concerning motivation and factors that motivate students to learn. In general, we are motivated by goals. When it comes to education, one of the first oft-repeated questions that we are asked from the time that we’re able to talk is ‘What do you want to be when you grow up?’. When we sit learning in classrooms for hours on end, we’re usually aware that there is a purpose and an end goal that will be the reward of doing well in school. Yet goals alone are not enough. We have to find a value in those goals, and we have to believe that they are achievable. For instance, someone may find tremendous value in the role of being a Premiership football player, but if he has ‘two left feet’, he won’t consider becoming one an achievable goal, and therefore, won’t find any motivation to train and practice his football skills on a regular basis. For instance, someone may find tremendous value in the role of being a Premiership football player, but if he has ‘two left feet’, he won’t consider becoming one an achievable goal, and therefore, won’t find any motivation to train and practice his football skills on a regular basis. Naturally, the value that someone puts on any goal is subjective, and the research suggests that there are 3 types in the context of the learner. Attainment value, intrinsic value and instrumental value. Attainment value is the value that someone puts in the final accomplishment of any activity. For example, driving around a city without knowing where you’re going might not be enjoyable for anyone, but it’s the final accomplishment of ‘catching all of the Pokémon’ that makes it all worthwhile in the eyes of some. Intrinsic value is the value that someone finds in simply doing an activity. For example, it may be the goal of someone to become a chef simply because they enjoy the process of cooking, whether they eat what they’ve made or not. Finally, instrumental value is the value that someone sees in doing something in order to achieve a more significant goal. Like in the example of someone who works hard to keep a job that they don’t enjoy in order to put food on the table and pay the bills. As mentioned above, simply finding value in a goal isn’t sufficient to bring about enough motivation to get students to study. The goal also has to be seen as being achievable. Just walking into a classroom and telling students that they’ll get good management jobs if they can speak English isn’t enough if the students see acquiring a whole new language as being too difficult and an unobtainable goal. This is even more so the case in Saudi, where as Western teachers, we often find ourselves responsible for teaching young adults at colleges and universities who are supposed to have been learning English for the last 6 years or more, but many of whom struggle to reach the level of an A1 student according to the Common European Framework of Reference. It’s critical to acknowledge that we may simply be seen as another teacher who ‘can’t make me understand this foreign language, just like my previous dozen or so teachers couldn’t make me understand’. Many fail to realise this, and when students then show little sign of having any motivation accordingly, it’s not uncommon to hear teachers put it down to laziness. There is also a third factor that influences motivation, and that is environment. Perceiving an environment as being supportive or unsupportive can make a student lose motivation for working towards a goal, even though he or she perceives that goal as both having value and being achievable. For example, a student might lose all motivation to study a given subject if he or she believes that the teacher either cannot or isn’t interested in helping them to understand the course content. So how can we use this information to try and influence the motivation of students in Saudi Arabia in particular? Firstly, it’s important to convey the real value that there is in learning a foreign language. Ironically, many teachers from Anglophone countries, as with many native English speakers in general, are not bilingual. In reality, in order to escape suspicions of hypocrisy, the ideal candidate for imparting the value of striving to learn English as a second language is someone who has benefitted from learning a second language themselves. Thankfully, it’s easy to find many senior Saudi staff who not only have excellent English language skills, but whose academic achievements are also well respected by the students. With this in mind, both Western and Saudi staff and teachers need to collaborate in order to build a culture where the benefits and the real value in learning the English language are continually made clear. Secondly, it’s up to the academic staff and teachers to work hard to develop effective syllabi and pedagogical strategies that set realistic outcomes, so that students don’t feel that what is being asked of them is unachievable. Just giving students a textbook when many of them may have already been through a number of textbooks by that stage without seeing any significant signs of improvement, almost certainly won’t do much to build confidence that this time is going to be any different. Well planned project-based learning can be used to promote collaboration between students and more able peers in order to co-construct a better understanding of the language and encourage motivation. Below is an example of a project that I worked on with some A1 level students, where they had to script a job interview that had to include different examples of target language that we had worked on previously. The students give their opinion on how the project went at the end of the video. Thirdly, the environment should be a visibly supportive one with teachers and staff members who are happy to collaborate with each other in order to help students as much as they can. As teachers, in terms of our goals, we’re no different from students in that we also need to see both value and efficacy within a supportive environment in order to maintain our motivation. Therefore, it’s important to set realistic goals, and not expect all students to suddenly show signs of increased motivation with every change that we make. The key point here is that understanding how we are motivated can help us to reflect on what we can do to encourage motivation in our students and ideally become better teachers.